1. Apply a coat of micro glitter polish and let it dry. 2. Stamp flower with blue stamping polish and wait for a minute before next step. 3. Apply a coat of jelly polish and let it dry. (because I used a blue jelly polish, yellow flowers are looking green in pictures). 5. Again apply one coat of jelly polish and wait till dry. 6. Stamp flowers with pink color and wait for few seconds. 7. Apply a coat of jelly polish and let dry. 8. Stamp flowers with orange stamping polish and let it dry. 9. Apply a quick dry top coat. 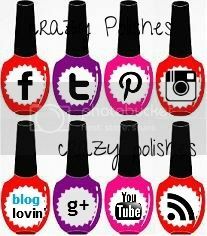 Because jelly polishes are thin in formula, they dries faster comparatively. So, the manicure actually doesn’t take as much time as one would think. Here’s a macro shot of the manicure. Have you tried pond manicure? Please share your experience. Love the vibrancy of this mania... we usually see those light colored jellies used in this kind of manicure. Love that it's something different.